Wow...Sold out in 20 hours with nearly twice as many tickets available! I am glad I was able to secure my tickets for myself and my friend. 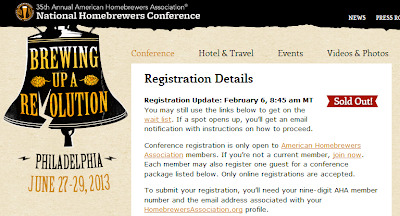 This will be my first year attending the National Homebrewers Conference. You can check out the full info here. I finally kicked my 5lb CO2 tank..lasted me abut 15 months! Got it refilled and my porter is carbing up. Should have a review of that soon. IPA in the fermentation chamber soon to be dry-hopped this weekend. That ought to be a good time! Are you entering any in the competition? Yea I can see that, but how cool would it be to have a beer in the 2nd round and to be at NHC for the banquet (if you're going to that part)! I'll be sending an APA, Bitter and Mild. 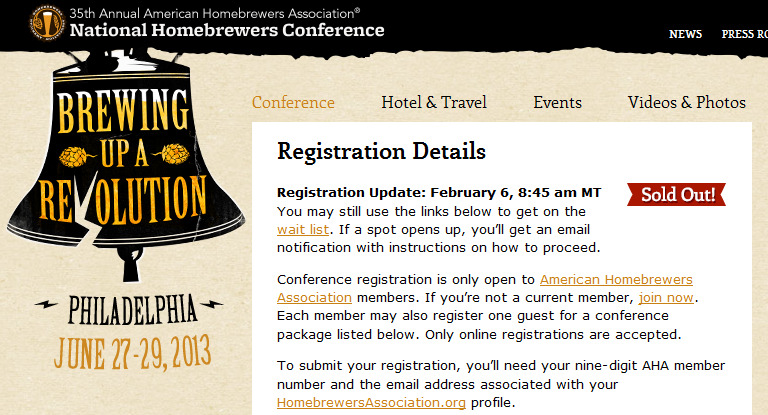 I wanted to brew more entries, but work/life got in the way. I'll have to plan better for next year. Valid point - I guess I should submit what I have so I never have to wonder "What-if" while I am sitting at the awards banquet! You are not gonna submit the award winning IIPA? Not this year, I decided that with work constraints and such I can really only brew 2 beers for NHC (and rebrew if they advance) and I picked the 2 recipes that I'm a bit more happy with (I love the IIPA, but I probably will tweak it further). I already had some Mild bottled up so I figured what the hell might as well enter that while I'm at it.